Check out how the one on the left has modified the shell to fit perfectly over his eyes. Also, if you've ever wondered what a baby crab exo looks like, here is one I found while doing my last count. I think my tweezers accidentally snagged it. I saw a shell down in a hole and tucked the exo back down there (after taking a photo) to what I think was its owner. Either way, the crab in the hole ate it and emerged the next day. So far, the longest molt I've noted (I can only track molts on days when I do a full count and remove all the crabs then wait for molters to come back up) has been three days. Either because they are the same age or because it's "a thing" (my adult hermits do it a lot, too), they are molting on a common schedule. I'll have a day when the whole tank is busy with babies eating and trying on shells and climbing, and then a few days when it's mostly quiet and they seem to be largely underground. 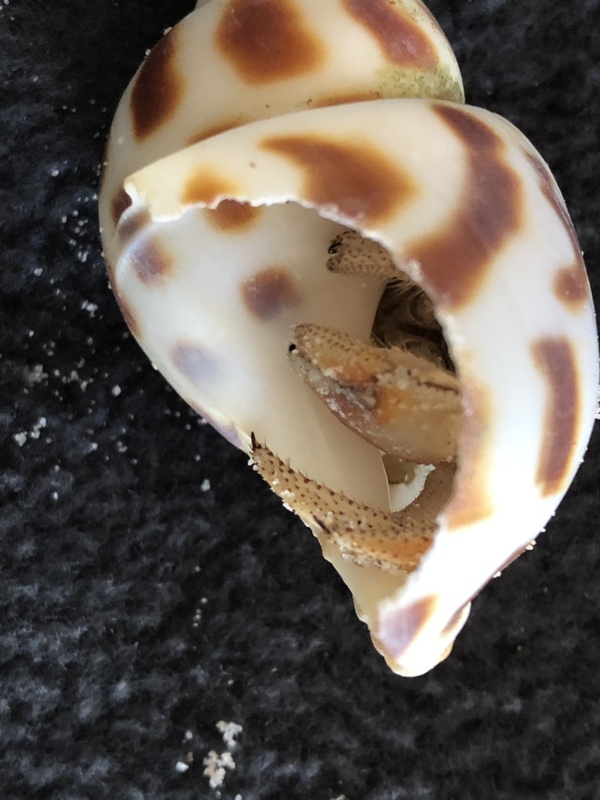 They do so many thing just like my adult hermits--poop in the shell shop, throw shells they don't like out onto the sand, climb up the silicone and hang from the top, drag away food that they really like and hoard it. So cute. I've started letting visitors hold them. Just for a minute or two on their palms, very carefully, but it's so interesting the effect these little guys have on people. First person to hold one was a friend who is going through chemotherapy and radiation for an aggressive cancer in his jaw. He's exhausted all the time and trying to stay hopeful. When he held one, his whole face changed and he teared up, saying. "This gives me hope," as the tiny baby walked across his hand. Today a three-year-old and her mother (who does clay with me every week) each very carefully got a chance to hold one. 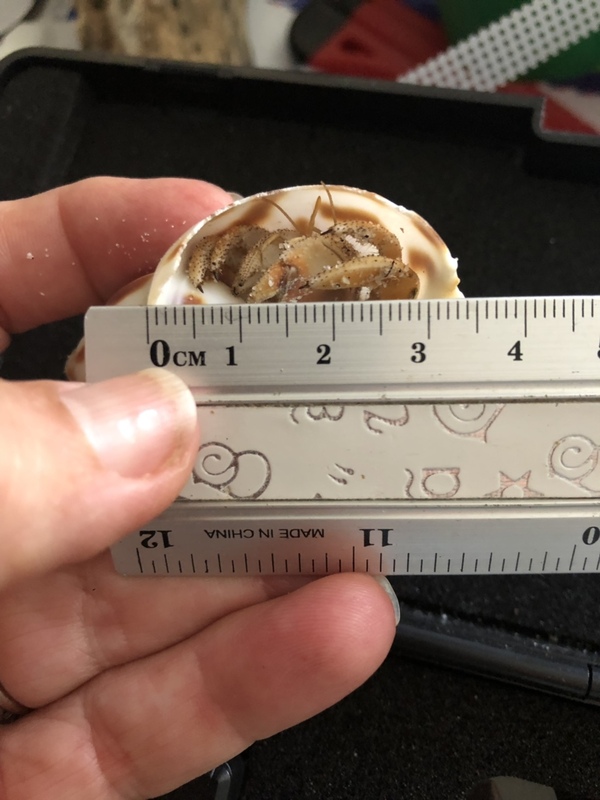 It's so cool when the shell gets placed on their palms and they wait, watching, so attentive...then these little tiny legs and eyes pop out and the little shell starts walking. You can see on their faces how magical it is. I forget. I've gotten pretty used to them--I mean, they're still magical to me, but also very familiar by now. It's good to see the magic in other people's faces. Later this month, I plan to put two babies in with my big hermits and see how they fare. I'm scared to do it, but I think it's an important piece of information we need to have--and the future adopters will want to know. I will also be selecting for the most social, least afraid crabs and probably keeping ten or so of each species. If I'm going to captive breed them, I might as well be selecting for the friendliest ones. Even if I don't have these long enough for the babies to come of breeding age, I'm hoping someone else may come along who will take up the torch and continue my work. Might as well have big and long term goals. Thanks for going on this journey with me. wow, this is all so exciting!! i cant wait to find out how they do with the big crabs. how many crabs are spoken for so far? do you have many left? 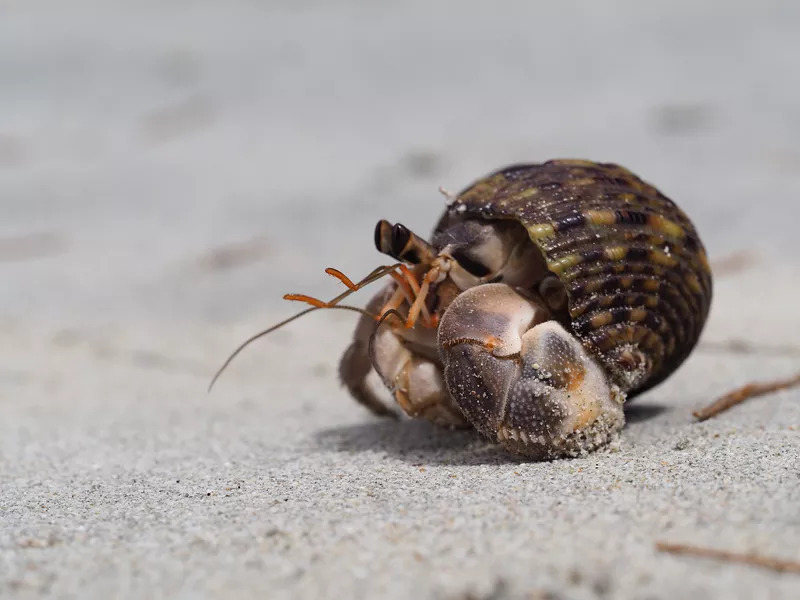 how old do hermit crabs have to be before they can reproduce? this idea of a captive breeding project is so exciting, thanks for all the work you've done! We have 25 adopters so far. I'm going to cap it at 50, just to be sure I have enough crabs to go around. There will be a waiting list, though, and those people on the waiting list should know about a month out if they've been moved to the accepted list (that's when I'll start to require payment of the adoption fees and when I'm guessing some people may also change their minds). I don't know that anyone knows for sure how old they have to be before they can reproduce. One of my adult breeding females is quite small, but we DO know for sure that size isn't an accurate indicator of age. Some just molt more frequently and/or grow faster. That's one thing that I'm really looking forward to studying--how these babies from the same clutch grow and behave over time in different setups with different conditions. All adopters have to agree to a quarterly check-in for the first year or two and a yearly one thereafter so we can chart their growth over time. I'm already seeing quite a bit of size disparity and they're only four months old. Some of that is likely due to the fact that (I'm pretty sure! )* I have two different species--since Es tend to be smaller than PPs and it's reasonable to assume they would grow more slowly from birth. *I say "I'm pretty sure!" because I still doubt myself every day. They look so similar. But I did have blue zoeae this time around and there's been a big difference in behavior (speed, shell selection, a general feistiness) since they were freeswimming larvae...but I just can't point yet and definitely say, "That's an E! That's a PP!" Even friends who are experts at species ID can't seem to come to a consensus, so I guess we'll just have to wait until their adult bodily structures become more established and divergent. Can you tell which species make up this crabby totem pole? You need to fill out an application at lhcos.com and fill out an application in order to adopt. Mary is asking a $50 per crab adoption fee to support her breeding attempts. You are also required to send quarterly updates on their growth for their life. You must also pick them up in person at the hermit crab convention in NY in July. It seems like a lot of money for a crab but I completely understand the reasons. It will be an exciting scientific study about their growth in different locations. These are pictures of one of my captive bred Aussies. This one hatched on 4th December 2016 so is just over 2 years old. I was stunned at the size leap this crab has just made and even more astounded in the huge modification to the shell. That was done in a matter of hours. Hope you don’t mind me posting this here Mary. wow its crazy how strong they are. thats some modification!